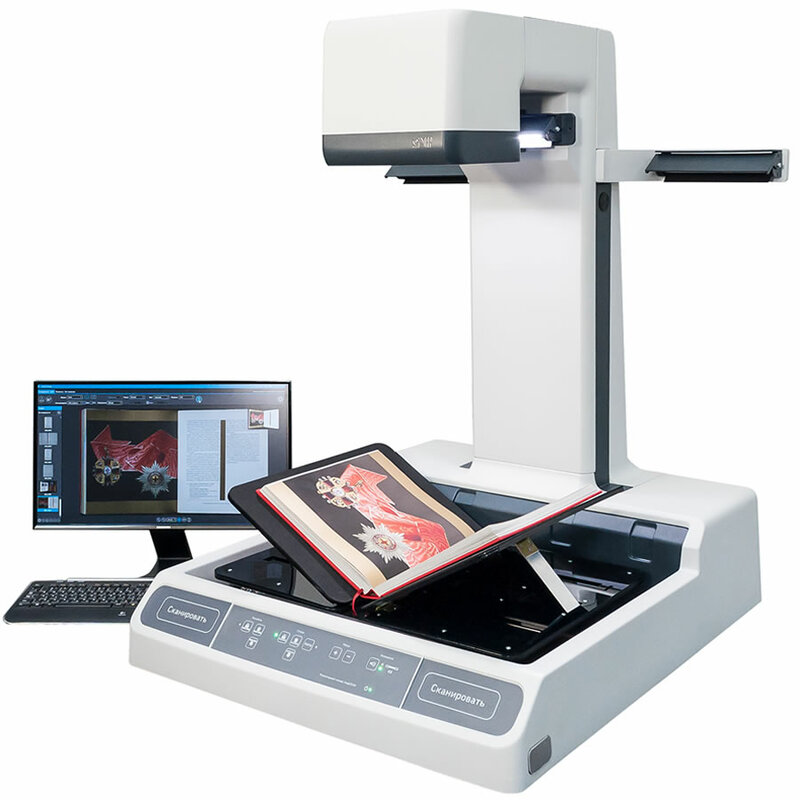 The all-in-one planetary ElarSCAN A2 book scanner is a professional contactless scanner and a unique desktop device for convenient digitizing of difficult documents and objects. It is used by libraries, archives, museums, universities, local governments, municipalities and other organizations to scan books, newspapers, bound files, drawings, medals, coins, samples of fabrics, artifacts, etc. Whether to produce digital copies, to digitize archival collections, or to serve as a self-service (walk-up) kiosk for students or patrons, the fast and friendly ElarSCAN A2 book scanner can do it all. ElarSCAN A2 planetary scanner offers the best price for features and performance on the market, comes with an embedded professional software and is widely recognized as an affordable, professional and user-friendly machine. Below are just a few examples of how ElarSCAN book scanners are used by various organizations to scan and digitize all kinds of documents, records and objects. Universities use ElarSCAN book scanners to digitise text, doctorate and reference books, providing content for e-learning courses, replacing copiers and helping advance paperless education. University, public, municipal and other libraries digitize journal articles and book chapters on request by researchers and readers. ElarSCAN planetary scanners are also used for self-scanning by students and visitors. Self-scanning, otherwise known as walk-up library scanning, is primarily used for digitizing periodicals and scientific articles. Municipalities and local governments use ElarSCAN book scanners to digitise record books, utility maps and journals for easy access online. One of the most important ElarSCAN applications is to scan paper registers and personal act books at public offices. Digitization of real estate files, archives of land property acts, which include hard-to-handle large format plans, drawings and maps, are other key applications of contactless planetary scanners. Digitization of archive catalogues of state archives, municipal archives, special and research archives is one of the key tasks for ElarSCAN contactless planetary scanners. Museums use them to digitize books and to create digital collections of small and mid-size museum items which are normally very difficult to scan e.g. coins, medals, cutlery, etc. ElarSCAN book scanner allows for fast single-shot digitizing (insensitive to slow movement of an object being scanned) and utilizes a macroscan feature to enlarge small items with a press of one button. Special manuscript models with extra large motorized cradles can scan extra thick volumes, such as parish and census registers which are half a metre thick or even thicker. Output Image Formats Single page: JPEG, BMP, GIF. Single- and multi-page: PDF, PDF/A, TIFF. Compression: LZW, CCITT G4, JPEG. Searchable PDF for 49 languages including Dutch, French, English and German. Dream scanner drawing on 20+ years of expertise in production scanning of heritage books, archive folders, newspapers, museum artifacts, etc.